Gardens are truly wondrous and are filled with growing potential, much like the children in our care. A garden may start out small, but with the proper care it has the power to bloom, prosper, and show its beauty and depth to all. In many ways, gardens reflect the potential in all of us and can bring communities together in the best way possible. The Roosevelt Square Village garden program was extremely popular last summer, and was enjoyed by both SOS Illinois families and neighborhood children. In addition to freely accessible organic produce at two Roosevelt Square Village raised bed sites, we expanded programming to provide two hours of nature and nutrition activities twice a week during the growing season. Children and parents alike came in droves to harvest produce for dinner and put in crop requests. Seeds for the Roosevelt Square Village were started in weekly batches indoors under grow lights. Garden beds were cleared and prepped and planted with the first round of early outdoor crops: lettuce, turnips, beets, peas, and spinach to name a few. Many of the children enjoyed garden maintenance work — especially digging, using wheelbarrows, and planting — thus forming the backbone of our spring and early summer program. They also loved helping plant our first in-ground seeds. They worked on following multi-step directions, turn taking, and breaking tasks into steps, while keeping the needs of the tiny seeds or fragile plants in mind. The children in our care learned about healthy soil, seed development, and plant families. As crops came in, tasting everything and cooking became exciting. All children learned to be adventurous. Bugs became a primary interest for all kids involved and the investigations of small creatures were featured heavily in activities. Children used magnifying glasses to inspect plants for bug infestations and to identify pests. Learning about butterflies and their ecosystem and ladybug hibernation were also informative sessions for all. During our garden sessions, the children loved to eat and snacked on raw beans, carrots, and tomatoes. Those activities that involved cooking and prepping were always fan favorites. We connected this with cultural traditions, food safety, and nutrition education. And whenever possible, we incorporated language development, sensory exploration, scientific methods, and art into all garden activities. Garden crafts were always a big hit as well. Six years after it was started on an empty grassy field, the Chicago Village garden has come into its own as an established and diverse habitat for hundreds of plants, insects, and wild animals. Its production capabilities continue to increase, along with its potential for learning. Activities in the permaculture garden in 2017 were centered on the growing cycle of our plants, along with expanding both play, sensory, and STEM learning opportunities. In addition to the usual crops, we planted three themed gardens that invited conversation about cultural heritage and the origins of American dishes. 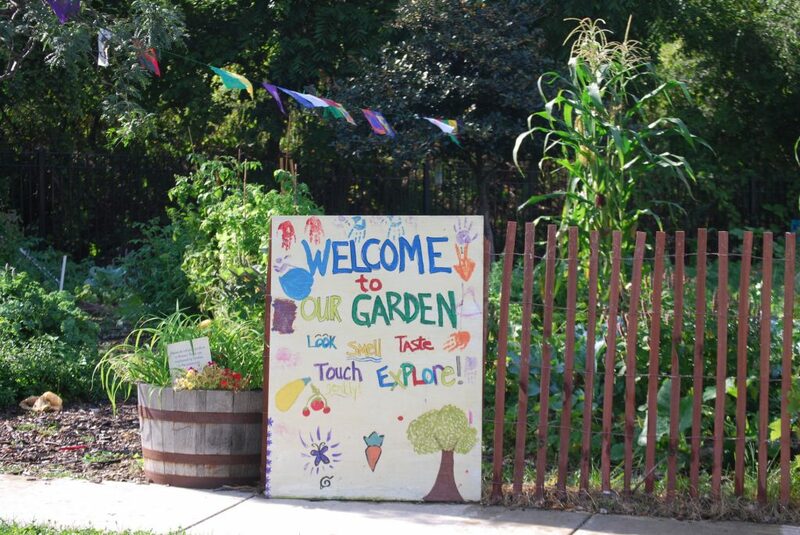 The Chicago Village garden is a permaculture-based garden at the edge of a wooded embankment. As such, it offers opportunities for learning about complete ecosystems. The children in our care discovered bees, butterflies, ladybugs, worms, and more. Many favorite garden art activities included making Tibetan prayer flags to hang in the garden, mobiles, painted signs, and insect rocks. With the assistance of teams of volunteers, we created a tactile, colorful ribbon room by hanging hundreds of long satin ribbons from the branches of a pine tree. What’s Needed To Make Gardens Even Better in 2018? We truly have enjoyed a resurgence in garden involvement, but in order for these gardens to continue to flourish and bloom in the way they were meant to be, more is required. The Roosevelt Square Village program is looking to engage Teenagers more fully in the maintenance, harvesting, composting, and perhaps creating a mini-farmer’s market on site with a teen jobs program. Additionally, the soil at the Roosevelt Square Village will also need to be amended with an additional four to six inches of organic compost. Although nutrients were added in 2017, the soil does not currently contain enough organic material to retain water, nutrients and tilth. What’s more, without compost bins, garden waste has been disposed of rather than recycled into new compost. With the addition of working compost bins, both garden waste and household food scraps could be composted and used as sustainable garden fertilizer. Together, we can make our 2018 garden dreams a reality. If you’re interested in helping make what blooms grow into something meaningful, click here to contribute.